In this mixed methods study, we used a convergent parallel design to create and analyze a task that was implemented across four US institutions with 99 preservice teachers (PSTs) using one of two multi-media platforms: LessonSketch or GoAnimate. We analyzed PSTs’ comic-based depictions or animations to examine the level of sophistication for teacher questioning, number of teacher utterances, use of visual information and format of classroom interaction, and features of conveyed time. PSTs who used GoAnimate included significantly more utterances than those who used LessonSketch, yet the level of questioning was statistically equivalent across both mediums. Artifacts created with GoAnimate tended to convey small group interactions, whereas LessonSketch depictions typically portrayed whole class interactions and included additional visual information. We discuss these findings and their specific implications for teacher educators to select and align use of such multi-media platforms for particular instructional aims. Weston, T., Kosko, K., Amador, J. & Estapa, A. (2018). Preservice Teachers’ Questioning: Comparing Platforms for Practice-Based Teacher Education. 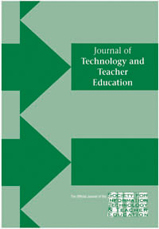 Journal of Technology and Teacher Education, 26 (1), 149-172. Waynesville, NC USA: Society for Information Technology & Teacher Education. Retrieved April 23, 2019 from https://www.learntechlib.org/primary/p/181137/. Annenberg Video Library. (2010). Cookies to Share. Retrieved from https://www.learner.org/resources/series32.html. Amador, J. & Earnest, D. (2016). Lesson plan-imation: Transforming preservice mathematics teachers’ lesson design experiences with animation. In M. Niess, S. Driskell, and K. Hollerbrands (Eds.) Handbook of research on transforming mathematics teacher education in the digital age (pp. 241271). Amador, J., Weston, T., Estapa, A., Kosko, K., & De Araujo, Z. (2016). Animations as a transformational approximation of practice to communicate professional noticing. Journal of Technology and Teacher Education, 24(2), 127-151. Chazan, D. & Herbst, P. (2012). Animations of classroom interaction: Expanding the boundaries of video records of practice. Teachers College Record, 114(3), 1–34. Chen, C.L. (2012). Learning to teach from anticipating lessons through comicsbased approximations of practice (dissertation). Ann Arbor, MI: University of Michigan. De Araujo, Z., Amador, J., Estapa, A., Weston, T., Aming-Attai, R & Kosko, K. (2015). Animating pre-service teacher noticing. Mathematics Teacher Education and Development 17(2), 25-44. Franke, M.L., Webb, N.M., Chan, A.G., Ing, M., Freund, D., & Battey, D. (2009). Teacher questioning to elicit students’ mathematical thinking in elementary school classrooms. Journal of Teacher Education, 60(4), 380-392. Glaser, B.G., & Strauss, A.L. (2009). The discovery of grounded theory: Strategies for qualitative research. Piscataway, NJ: Transaction Publishers. Grant, T.J., & Kline, K. (2010). The impact of video-based lesson analysis on teachers’ thinking and practice. Teacher Development, 14(1), 69-83. Grossman, P., Compton, C., Igra, D., Ronfeldt, M., Shahan, E., & Williamson, P.W. (2009). Teaching practice: Across-professional perspective. Teachers College Record, 111(9), 2055–2100. Herbst, P., Chazan, D., Chieu, V.M., Milewski, A., Kosko, K.W., & Aaron, W.R. (2016). Technology-mediated mathematics teacher development: research on digital pedagogies of practice. In M. Niess, S. Driskell, and K. Hollerbrands (Eds.) Handbook of research on transforming mathematics teacher education in the digital age (pp. 78-106). Hershey, PA: IGI Global. Herbst, P., Chieu, V.M., & Rougée, A. (2014). Approximating the practice of mathematics teaching: What learning can web-based, multimedia storyboarding software enable? Contemporary Issues in Technology and Teacher Education, 14(4). Herbst, P., & Kosko, K.W. (2014). Using representations of practice to elicit mathematics teachers’ tacit knowledge of practice: a comparison of responses to animations and videos. Journal of Mathematics Teacher Education, 17(6), 515-537. Hiebert, J. & Wearne, D. (1993). Instructional tasks, classroom discourse, and students’ learning in second-grade arithmetic. American Educational Research Journal, 30(2), 393 – 425. Hill, H.C., Ball, D.L., & Schilling, S.G. (2008). Unpacking pedagogical content knowledge: Conceptualizing and measuring teachers’ topic-specific knowledge of students. Journal for Research in Mathematics Education, 39(4), 372-400. Hosmer, D.W., & Lemeshow, S. (2000). Applied logistic regression (2nd Ed.). New York: John Wiley& Sons, Inc.
Hufferd-Ackles, K., Fuson, K.C., & Sherin, M. (2004). Describing levels and components of a math-talk learning community. Journal for Research in Mathematics Education, 35(2), 81-116. Kosko, K.W. (2012). Student enrollment in classes with frequent mathematical discussion and its longitudinal effect on mathematics achievement. The Mathematics Enthusiast, 9(1 & 2), 111-148. Kosko, K.W. (2016). Primary teachers’ choice of probing questions: Effects of MKT and supporting student autonomy. IEJME – μathematics Education, 11(4), 991-1012. Kosko, K.W. (2014). Using multi-decision scenarios to facilitate teacher knowledge for mathematical questioning. In M.J. Mohr-Schroeder& S.S. Harkness (Eds. ), Proceedings of the 113th annual convention of the School Science and Mathematics Association (pp. 23-30). Jacksonville, FL: SSMA. Kosko, K.W., Rougée, A., & Herbst, P. (2014). What actions do teachers envision when asked to facilitate mathematical argumentation in the classroom? Mathematics Education Research Journal, 26(3), 459-476. McDonald, M., Kazemi, E. & Kavanagh, S.S. (2013). Core practices and pedagogies in teacher education: A call for a common language and collective activity. Journal of Teacher Education, 64(5), 378-386. Moreno, R. & Ortegano-Layne, L. (2008). Do classroom exemplars promote the application of principles in teacher education? A comparison of videos, animations, and narratives. Educational Technology Research and Development, 56(4), 449-465. Sun, J., & Van Es, E.A. (2015). An exploratory study of the influence that analyzing teaching has on preservice teachers’ classroom practice. Journal of Teacher Education, 66(3), 201-214. Webel, C., & Conner, K.A. (2017). Using simulated teaching experiences to perturb preservice teachers’ mathematics questioning practices. Mathematics Teacher Educator, 6(1), 9-26. Weiland, I., Hudson, R., & Amador, J. (2014). Preservice formative assessment interviews: The development of competent questioning. International Journal of Science and Mathematics Education, 12, 329-352.